The Bristol Evening Post’s 80th anniversary bash was accompanied by loud protests as demonstrators gathered outside the Galleries shopping centre, hosting an exhibition celebrating the BEP’s 80 years, to voice their opposition to yet more redundancies at the Evening Post, the abandonment of the Saturday edition and the end of Venue in print. 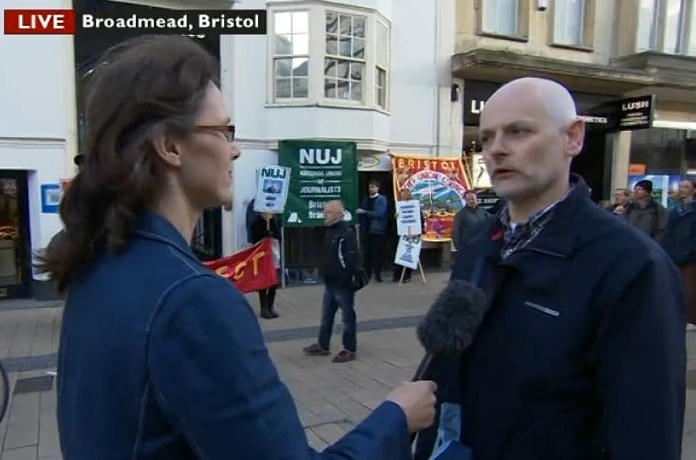 BBC Points West provided some great live coverage of the demonstration by members of Bristol Branch National Union of Journalists, representatives of the Respect party, the Bristol Trades Council, BADACA and members of the public. Many thanks to all who turned up. You can see the report on iPlayer by clicking here. At last many people – not just journalists – seem to realise that newsgathering in our city under the control of Northcliffe (also owner of the Daily Mail) is approaching a crisis point. Bristol NUJ Branch chair Paul Breeden said it was the people of Bristol who would lose out when staffing on the city’s only dedicated daily newspaper was reduced by a third to fewer than 40 journalists. Six years ago there were close to 190 journalists working in the city on the Post, Western Daily Press and Observer. • Northcliffe, under its owner Viscount Rothermere, has been trying to sell Bristol and its other regional centres for years. The Bristol branch of the NUJ believes it’s time to make clear that important papers like the Post are not safe in Northcliffe’s hands. Companies like Northcliffe were happy to take fat profit margins for their shareholders from Bristol when times were good – indeed, the Post is still making a profit*. But when times get tough, the returns to shareholders continue** – while Bristol journalists lose their jobs, those left have to work even harder, and the wider community realises it is not going to get proper coverage. How can a hollowed-out Bristol Post report fully on important issues like the debate over a city mayor, our transport system, the future of our two football clubs, our vibrant business and arts scenes? Why should Viscount Rothermere continue to benefit from the sweat of Bristol journalists if he’s not prepared to stand by them, and the community they serve, when times are tough? After all, he can afford to: he’s in the top 100 of the Sunday Times Rich List, and his family fortune jumped by £122 million in 2010 to £730m. And though he lives in a mock Palladian stately home in Wiltshire, he appears to be officially domiciled in France, to the benefit of his tax bill. In a further twist, he ensures that ultimate ownership of the Post and his Daily Mail empire is vested in Bermuda – no doubt with similar benefits to the company accounts. Bristol NUJ believes our city deserves better. * The most recently filed accounts for Bristol News & Media show operating profit of £1.5million in 2010 on turnover of £25.5m. **The most recent (2011) accounts for parent group DMGT include: “Management seeks above-average growth in adjusted earnings per share to maximise returns for its owners.” DMGT is committed “to maintain dividend growth in real terms every year”. Translated, that means shareholders come before journalists – and readers. Have copied & pasted this message. Not surprised about Northcliffe but am continuously frustrated by the number of people who will not buy the Post but read it on line. The Post journalists do a difficult job very well. But that’s the problem, Julie. In their obsession with digital (which they know little about), they have thrown away the thing they had that was unique. If you were told you had a choice of paying for your weekly shopping, and going to get it, or getting the same food free and delivered to your house, which would you take? That said, it would be nice to hear some new ideas, not just the usual ‘it’s a disgrace they are making cuts’. And making petty points about Rothermere is a waste of time, however appalling his company’s attitude to regional papers has been.